Sister vehicle to 9124E, 24278 has an almost identical history. Built at York in 1937, in varnished teak and with electric cooking. Rebuilt in 1958 with propane cooking, by now numbered 9122E it differed from 9124E by remaining on the Eastern region, ending its days in East Anglia. In the early 1970's BR gave it a further overhaul - only to have it catch fire on its first trip out! It was promptly withdrawn, and equally promply purchased by RVP. Moving to the GCR in 1981 (and sold to them in 1983) its fire damage prevented an easy return to service, but it did receive cosmetic attention for a filming contract in 1986. Subsequently ownership passed back to an RVP member and it has been the subject of a major rebuild since 2001. In 2005 this vehicle was donated back to RVP ownership, and the restoration work continued as part of our project to return a teak train to the GCR. 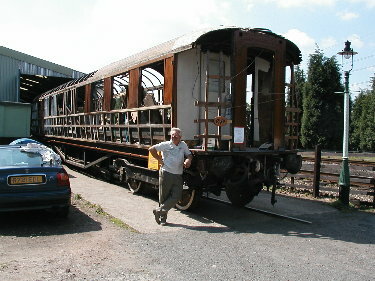 This is a very extensive task, and to date (July 2009) the underframe and bogies, roof, bodysides and frames are all complete. Outstanding tasks primarily revolve around fitting the interior out to its 1937 condition and rebuilding the kitchen. We expect it to enter service on the GCR in late 2010.